The United Kingdom - Each tribe gave up its autonomous nature and the twelve clans were united under kings. It is not surprising that Israel's first sovereign met much opposition. Saul was the test case to prove or disprove the wisdom of the transition now made. He gained favor for the victories he won over the enemy, but drew violent criticism for his unstable character as a king under God. When Saul engaged in priestly duties which didn't belong to his jurisdiction, Samuel objected and declared that a new king would rise up to take Saul's place on the throne. Saul's Kingship Deteriorates - The idea of losing the kingship was devastating to Saul. Seeing David as a political rival for the throne, Saul set out on a course designed to eliminate David as a contender for the crown. Torn by jealousy and hatred, the ill-appointed king spent himself in pursuit of his rival. Useless to the kingdom he ruled, Saul finally met his fate at the hands of the Philistines and then died from a self-inflicted wound. His death opened up the way to the great second era of the United Kingdom. David mourned the death of Saul when he met his fate at the hands of the Philistines. David sent his personal thanks for their courageous deed to the Northerners who risked their lives to give Saul a decent burial. David jeopardized his relationship with his own commander, Joab, to capitalize on the friendly overtures from the North when Abner shifted his allegiance from the North to the South over the incident of Saul's concubine. David mourned the death of the Northern chief, Ishbosheth, and rebuked his own commander, Joab, for the murder of Abner. When two rebels from the North brought the head of the Northern king, Ishbosheth, to him, David had the rebels killed. These noble acts had an impact on the North. David's manliness, courage, and godliness soon dissolved the Northern opposition; and Israel soon sought out David and made him king over the whole nation. Political Headquarters Established at Jerusalem - The new king's first act was to establish a political headquarters in the center of the nation. David's private army launched an attack on the fortress city of Jerusalem, which was still held by the Jebusites who yielded and Jerusalem became Israel's capital. Philistine Menace is Obliterated - A capital city and the resultant unity between the North and South threatened Philistia's designs for conquest. If David could conquer Jerusalem, he could thwart Philistia's plans. Consequently, the western seacoast power massed its forces for an all-out attack on David's army. David surprised them by taking the offensive first and crushed the Philistines with two major thrusts. The major threat to Israel's way of life was broken. Jerusalem Becomes the Religious Center - With the Philistine menace gone, David had the Ark of the Covenant moved to Jerusalem. With the Ark within the capital city, Jerusalem became the center of the religious and political endeavor of his people. Pilgrimages, the celebration of holy days, the commemoration of national events, the participation in feasts and memorials, all in Jerusalem, would unite the North and South by bringing the tribes together. With the twelve tribes working as a unit, all that Israel attempted was marked with success. Political threats were thwarted and the territory of the nation was expanded to include the "promised limits" as first set down by Joshua at the time of the initial invasion. The Age of Splendor Was Not to Last - The nation enjoyed success in this period because its people put obedience to God before personal, political, or mundane interests. David saw to that by preaching that obedience to God was a prerequisite to wholesome and rewarding national life. But sin had always awaited its opportunity to turn blessings into curses. David was vulnerable to temptation and allowed lust to overcome him. The sins of the father became sins of a son and disobedience within David's own household soon began to undermine the glory which had been Israel's. Sons Absalom, Adonijah, and Solomon all added humiliation to the household of David and the prophecy of Nathan came shockingly true. The Reign of Solomon - The era of Solomon was the last of the United Kingdom. He began his reign with deep concern for the things of God, but ultimately divided his loyalty between many gods. A man of great wisdom at the outset, he later succumbed to a kind of materialistic philosophy that brought ruin to the state. Obsessed with the idea of building Israel into a nation to rank first among greats, Solomon launched an expansion program which ultimately put his own people under a heavy tax load. He introduced forced labor to meet the needs of an ambitious building program and he traded Israelite property to foreign kings to raise monies for his projects. The burdens imposed by the king's commerical policies and his building program was soon too great for the people to bear. The nation was ready for rebellion and did so at Solomon's death, opening a breach between the North and South. Unity, conceived under Saul, broadened by David, now degenerated under Solomon. The United Kingdom was to become divided again. 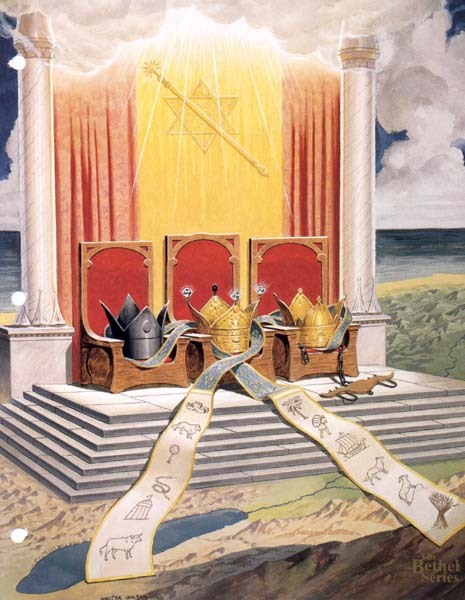 Banner entwines itself around and through crowns - The twelve tribes are united under kings. Pillars rising from thone base to heavens - The idea persisted that kings should be established by divine commission rather than by blood succession. Crown on far left - The reign of Saul. Crown in center - The reign of David. Star of David, mace of leadership, and light over David's crown - David's reign was the great golden age of Israel's history, and a focal point for revisionist dreams in the New Testament era. First diamond - Jerusalem was made capital city of Israel. Second diamond - Philistine menace and other political threats were obliterated. Third diamond - Jerusalem was established as ecclesiastical headquarrters of the new state. Dark pearl - Disunity in the United Kingdom began as a result of David's sin with Bathsheba. Third crown on far right - The reign of Solomon. Yoke attached to third crown - Solomon's expansionist policies lead to heavy tax loads which incited a rebellion within the United Kingdom.